Or go to Central Books & type in "Wealth of the Commons"
At least since Rachel Carson’s Silent Spring, we have known about humankind’s squandering of nonrenewable resources, its careless disregard of precious life species and its overall contamination and degradation of delicate ecosystems. In recent decades, these defilements have assumed a systemic dimension. Lately we have come to realize the shocking extent to which our atmospheric emission of carbon dioxide and other greenhouse gases threatens Planet Earth. If the human species is going to overcome the many interconnected ecological catastrophes now confronting us, this moment in history requires that we entertain some bold modifications of our legal structures and political culture. We must find the means to introduce new ideas for effective and just environmental protection – locally, nationally, regionally, globally, and points in between. We believe that effective and just environmental protection is best secured via commons- and rights-based ecological governance, operational from local to global and administered according to principles rooted in respect for nature and fellow human beings. We call it “green governance.” We also believe that the rigorous application of a reconceptualized human right to a clean and healthy environment (or “right to environment”) is the best way actually to promote environmental well-being while meeting everyone’s basic needs. It is our premise that human societies will not succeed in overcoming our myriad eco-crises through better “green technology” or economic reforms alone; we must pioneer new types of governance that allow and encourage people to move from anthropocentrism to biocentrism, and to develop qualitatively different types of relationships with nature itself and, indeed, with each other. An economics and supporting civic polity that valorizes growth and material development as the precondition for virtually everything else are ultimately a dead end – literally. Achieving a clean, healthy and ecologically balanced environment requires that we cultivate a practical governance paradigm based on, first, a logic of respect for nature, sufficiency, interdependence, shared responsibility and fairness among all human beings; and, second, an ethic of integrated global and local citizenship that insists upon transparency and accountability in all activities affecting the integrity of the environment. The basic problem is that the price system, seen as the ultimate governance mechanism of our polity, falls short in its ability to represent notions of value that are subtle, qualitative, long-term and complicated. These are, however, precisely the attributes of natural systems. The price system has trouble taking account of qualitatively different types of value on their own terms, most notably the “carrying capacity” of natural systems and their inherent usage limits. Exchange value is the primary if not the exclusive concern. This, in fact, is the grand narrative of conventional economics. Gross Domestic Product represents the sum total of all market activity, whether that activity is truly beneficial to society or not. Conversely, anything that does not have a price and exists “outside” the market is regarded (for the purposes of policymaking) as having subordinate or no value. What is more, it is an open secret that various industry lobbies have captured if not corrupted the legislative process in countries around the world; and that the regulatory apparatus, for all its necessary functions, is essentially incapable of fulfilling its statutory mandates, let alone pioneering new standards of environmental stewardship. Further, regulation has become ever more insulated from citizen influence and accountability as scientific expertise and technical proceduralism have come to be more and more the exclusive determinants of who may credibly participate in the process.Given the parameters of the administrative State and the neoliberal policy consensus, truly we have reached the limits of leadership and innovation within existing institutions and policy structures. Still, it will not be an easy task to make the transition from State/Market ecological governance to commons- and rights-based ecological governance. Green governance is, indeed, a daunting proposition. It entails serious reconsideration of some of the most basic premises of our economic, political and legal orders, and of our cultural orders as well. It requires that we enlarge our understanding of “value” in economic thought to account for nature and social well-being; that we expand our sense of human rights and how they can serve strategic as well as moral purposes; that we liberate ourselves from the limitations of State-centric models of legal process; and that we honor the power of non-market participation, local context, and social diversity in structuring economic activity and addressing environmental problems. Of course, there is also the deeper issue of whether contemporary civilization can be persuaded to disrupt the status quo to save our “lonely planet.” Much will depend on our ability to articulate and foster a coherent new paradigm of ecological stewardship. Fortunately, there are some very robust, encouraging developments now beginning to flourish on the periphery of the mainstream political economy. These include insurgent schools of thought in economics, ecological management, and human rights aided by fledgling grassroots movements, e.g., the Occupy movement and Internet communities. Although disparate and irregularly connected, each seeks in its own way to address the many serious deficiencies of centralized governments (corruption, lack of transparency, rigidity, a marginalized citizenry) and concentrated markets (externalized costs, fraud, the bigger-better-faster ethos of material progress). Taken together, these trends suggest the emergent contours of a new paradigm of ecological governance. For all their power and potential, however, none of these movements or their visions can prevail without some serious grounding in law. And in this regard we believe the legal and moral claims of human rights can be the kind of powerful, mobilizing discourse that is needed for real change. Human rights can provide a broad, flexible platform and a respected legal framework for asserting the right of everyone to a clean and healthy environment. Human rights signal a public order of human dignity, for which environmental well-being is essential. They consequently challenge and make demands upon State sovereignty, and upon the parochial agendas of private elites as well. They trump most other legal obligations, being juridically more elevated than commonplace “standards,” “laws,” or mere policy choices. And they carry with them a sense of entitlement on the part of the rights-holder, and thus facilitate legal and political empowerment. As a cluster of procedural entitlements generated from a “reformulation and expansion of existing human rights and duties” (akin to the derivative substantive rights noted first above) and commonly referred to as “procedural environmental rights,” i.e., the right to environmental information, to participation in decisionmaking, and to administrative and judicial recourse. A careful review of each of these official manifestations of the right to environment around the world reveals that, however robust in their particularized applications, they are essentially limited in their legal recognition and jurisdictional reach. It also shows that, as part of our legal as well as moral inheritance, the right to environment needs to be taken extra seriously. For this to happen – indeed, for Earth itself to survive and be hospitable to life upon it– the right must be reimagined and reinvigorated, and as soon as possible. Juridically, this right is most strongly recognized in its derivative form, i.e., derived from other recognized legal rights, rather than in its autonomous form, i.e., legally recognized in its own right. When framed autonomously, interestingly, the right is found to exist principally – indeed, almost exclusively – in the developing worlds of Africa, Asia, and Latin America. There is also a growing sentiment (primarily at the regional level so far) to recognize procedural environmental rights. But at bottom, it seems that as long as ecological governance remains in the grip of essentially unregulated (liberal or neoliberal) capitalism, there never will be a human right to environment – certainly not an autonomous one, widely recognized and honored across the globe in any formal or official sense. In recent years, however, two attractive alternative approaches have emerged. The first approach – intergenerational environmental rights – though firm in legal theory, relies heavily on its ability to appeal to the moral conscience. The second – nature’s environmental rights – pioneered by the governments of Ecuador and Bolivia, chooses to alter the procedural playing field altogether. These nations assert that nature has legal rights of its own that must be defended by human surrogates. Both these approaches go beyond the narrow anthropocentrism of existing law. In their legal character they are autonomous rights rather than derivative rights. They look to claimant surrogates to enforce the rights. And they are asserted primarily at the official national and subnational levels. Politically, both approaches reflect a deep frustration with the environmental community’s conventional terms of advocacy and with the formal legal order’s deep commitments to neoliberalism. However, barring some game-changing ecological disaster, huge economic and political forces will continue to resist these innovative legal gambits for reasons that are both historical and philosophical. Green governance that looks to the Commons points toward a different approach for securing a right to a clean and healthy environment. It calls for the establishment of a new procedural environmental right, the human right to commons- and rights-based ecological governance. A commons is a regime for managing common-pool resources that eschews individual property rights and State control. It relies instead on common property arrangements that tend to be self-organized and enforced in complex, idiosyncratic social ways. A commons is generally governed by what we call Vernacular Law – the “unofficial” norms, institutions, and procedures that a peer community devises to manage community resources on its own, and typically democratically. State Law and action may set the parameters within which Vernacular Law operates, but it does not directly control how a given commons is organized and managed. 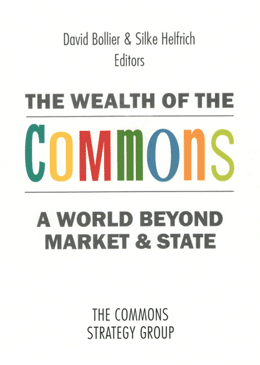 In this way, the Commons operates in a quasi-sovereign manner, similar to the Market but largely escaping the centralized mandates of the State and the logic of Market exchange while mobilizing decentralized participation “on the ground.” In its broadest sense, the Commons could become an important vehicle for assuring a right to environment at local, regional, national, and global levels. But this role will require innovative legal and policy norms, institutions and procedures to recognize and support Commons as a matter of law. The Commons represents an advance over existing governance because it gives us practical ways of naming and protecting value that the market is incapable of doing, and, as already noted, in an essentially democratic manner. For example, the Commons gives us a vocabulary for talking about the proper limits of Market activity—and for enforcing those limits. Commons discourse helps force a conversation about the “market externalities” that often are shunted to the periphery of economic theory, politics and policymaking. It asks questions such as: How can appropriate limits be set on the market exploitation of nature? What legal principles, institutions, and procedures can help manage a shared resource fairly and sustainably over time, sensitive to the ecological rights of future as well as present generations? The paradigm of green governance is compelling because it comprises at once a basis in rich legal tradition that extends back centuries, an attractive cultural discourse that can organize and personally energize people, and a widespread participatory social practice that, at this very moment, is producing practical results in projects big and small, local and transnational. Commons have been a durable transcultural institution for assuring that people can have direct access to, and use of, natural resources, or that government can act as a formal trustee on behalf of the public interest – what we call “State trustee commons.” Commons regimes have acted as a kind of counterpoint to the dominant systems of power because, though the structures of State power have varied over the centuries (tribes, monarchies, feudal estates, republics), managing a forest, fishery, or marshland as a commons addresses certain ontological human wants and needs that endure: the need to meet one’s subsistence needs through cooperative uses of shared resources; the expectation of basic fairness and respectful treatment; and the right to a clean, healthy environment. In this sense, the various historical fragments of what may be called “commons law” (not to be confused with the common law) constitute a legal tradition that can advance human and environmental rights. These regimes speak to the elemental moral consensus that all the creations of nature and society that we inherit from previous generations should be protected and held in trust for future generations. In our time, the State and Market are seen as the only credible or significant forces for governance. But in fact the Commons is an eminently practical and versatile mode of governance for ecological resources, among many other forms of shared wealth. The viability of the Commons has been overlooked not just because of the persistence of the Hardin “tragedy” parable and the overweening power of the State/Market, but because the Commons exists in so many forms and is managed by so many different types of commoners. For a shift to this paradigm to take place, State law and public policy must formally recognize and support the countless commons that now exist and the new ones that must be created. By such means, the State, working with civil society, could facilitate the rise of a Commons Sector, an eclectic array of commons-based institutions, projects, social practices, and values that advance the policy of collective action. Extending to the Commons the legal recognition and generous backing the “free state” and “free market” have enjoyed for generations would unleash tremendous energy and creativity needed to provide better institutional stewardship of our planet. Such recognition of Commons could also help transform the State and Market in many positive ways, not least by checking the cronyism, corruption and secrecy that currently mark each. Catalytic legal strategies that commoners (civil society and distinct communities), the State, and international intergovernmental bodies can pursue to validate, protect and support ecological commons thus defined. Among the most important are the following: 1) reliable information is available about the immediate and long-term costs and benefits of actions; 2) the individuals involved see the resources as important for their own achievements and have a long-term time horizon; 3) gaining a reputation for being a trust­worthy reciprocator is important to those involved; 4) individuals can com­municate with at least some of the others involved; 5) informal monitoring and sanctioning is feasible and considered appropriate; and 6) social capital and leadership exist, related to previous successes in solving joint problems (Poteete, Janssen and Ostrom 2010). Ostrom notes that “extensive empirical research on collective action...has repeatedly identified a necessary central core of trust and reciprocity among those involved that is associated with successful levels of collective action.” In addition, “when participants fear they are being ‘suckers’ for taking costly actions while others enjoy a free ride,” it enhances the need for monitoring to root out deception and fraud. If any commons is to cultivate trust and reciprocity and therefore enhance its chances of stable collective management, its operational and constitutional rules must be seen as fair and respectful. To that end, ecological commons must embody the values of human dignity as expressed in, optimally, the Universal Declaration of Human Rights and nine core international human rights conventions that have evolved from it or those of them as may be applicable. As this suggests, both human rights and nature’s rights are implicit in ecological commons governance. Macro-principles and policies. For larger-scale common-pool resources – national, regional, global – the State must play a more active role in establishing and overseeing commons. The State may have an indispensable role to play in instances where a resource cannot be easily divided into parcels (the atmosphere, oceanic fisheries) or where the resource generates large rents relative to the surrounding economy, e.g., petroleum. In such cases, it makes sense for the State to intervene and devise appropriate management systems. State trustee commons typically manage hard and soft minerals, timber, and other natural resources on public lands, national parks and wilderness areas, rivers, lakes and other bodies of water, State-sponsored research, and civil infrastructure, among other things. In such circumstances, however, there is a structural tension between commoners and the State/Market because the State has strong economic incentives to forge deep political alliances with the Market and thus promote an agenda of privatization, commoditization and globalization despite the adverse consequences for ecosystems and commoners. Any successful regime of commons law must therefore recognize this reality and take aggressive action to ensure that the State/Market does not betray its trust obligations, particularly by colluding with market players in acts of enclosure. Catalytic legal strategies. Perhaps the most significant challenge in advancing commons governance is the liberal polity’s indifference or hostility to most collectives (corporations excepted). Accordingly, commoners must use ingenious innovations to make their commons legally cognizable and protected. Since legal regimes vary immensely around the world, our proposals should be understood as general approaches that obviously will require modification and refinement for any given jurisdiction. Still, there are a number of legal and activist interventions that could help advance commons governance in select areas. Devising ingenious adaptations of private contract and property law is a potentially fruitful way to protect commons. The basic idea is to use conventional bodies of law serving private property interests, but invert their purposes to serve collective rather than individual interests. The most famous example may be the General Public License, or GPL, which copyright owners can attach to software in order to assure that the code and any subsequent modifications of it will be forever accessible to anyone to use.4 The GPL was a seminal legal innovation in helping to establish commons for software code. The “stakeholder trust” could be used to manage and lease ecological resources on behalf of commoners, with revenues being distributed directly to commoners. This model is based on the Alaska Permanent Fund, which collects oil royalties from state lands on behalf of the state’s households. Some activists have proposed an Earth Atmospheric Trust to achieve similar results from the auctioning of rights to emit carbon emissions. Federal and provincial governments have a role to play in supporting commons formation and expansion. State and national governments usually have commerce departments that host conferences, assist small businesses, promote exports and so on. Why not analogous support for commons? Governments could also help build translocal structures that could facilitate local and subnational commons, such as Com­munity Supported Agriculture and the Slow Food movement, and thereby amplify their impact. The public trust doctrine of environmental law can and should be expanded to apply to a far broader array of natural resources, including protection of the Earth’s atmosphere. This would be an important way to ensure that States act as conscientious trustees of our common ecological wealth. Various digital networking technologies now make it possible to reinvent the administrative process to be more transparent, parti­cipatory and accountable – or indeed, managed as commons. For example, government wikis and “crowd-sourcing” platforms could help enlist citizen-experts to participate in policymaking and enforcement. “Participatory sensing” of water quality and other environmental factors could be decentralized to citizens with a stake in those resources. It might be claimed that green governance is a utopian enterprise. But the reality is that it is the neoliberal project of ever-expanding consumption on a global scale that is the utopian, totalistic dream. It manifestly cannot fulfill its mytho­logical vision of human progress through ubiquitous market activity. It simply demands more than Nature can deliver, and it inflicts too much social inequity and disruption in the process. The first step toward sanity requires that we recognize our myriad ecological crises as symptoms of an unsustainable cultural, socio­economic and political worldview. Moving to green governance will entail many novel complexities and impon­derable challenges. Yet there is little doubt that we must re-imagine the role of the State and Market, and imagine alternative futures that fortify the Commons Sector. We must gird ourselves for the ambitious task of mobilizing new energies and commitments, deconstructing archaic institutions while building new ones, devising new public policies and legal initiatives, and cultivating new under­standings of the environment, economics, human rights, governance, and commons. Baslar, Kemal. 1998. The Concept of the Common Heritage of Mankind and International Law. Boston, MA. Martinus Nijhoff Publishers. 1997. Poteete, Amy R., Marco A. Janssen and Elinor Ostrom. 2010. Working Together: Collective Action, the Commons and Multiple Methods in Practice. Princeton, NJ. Princeton University Press. This essay is derived from a longer treatise available at The Commons Law Project, at http://www.commonslawproject.org. Bollier and Weston will publish a book on this topic, Green Governance, in early 2013 (Cambridge University Press). 1. See also the essay by Prue Taylor in Part 5. 2. The term “triarchy” is Michel Bauwens’, who expounds on the topic at the P2P Foundation blog, at http://blog.p2pfoundation.net/the-new-triarchy-the-commons-enterprise-the-State/2010/08/25. Peter Barnes has also been an early expositor of the Commons sector, especially in his Capitalism 3.0: A Guide to Reclaiming the Commons (2006). 4. See Benjamin Mako Hill’s essay on free software in Part 4. 5. See David Martin’s essay on public-domain technologies in Part 4. 6. See Gerd Wessling’s essay on the Transition movement in Part 3. David Bollier (USA) is an author, activist and independent scholar of the commons. He is Co-Founder of the Commons Strategies Group and the author of ten books, including Viral Spiral, Brand Name Bullies and Silent Theft. He lives in Amherst, Massachusetts and blogs at http://Bollier.org. Burns H. Weston (USA) is Distinguished Professor of Law Emeritus & Senior Scholar at the Center for Human Rights at the University of Iowa. He is Director of the Climate Legacy Initiative, Co-Director of the Commons Law Project (CLP) and Fellow of the World Academy of Art and Science. He co-edited World Order: A Problem-Oriented Coursebook (2011). Content on this site is licensed under a Creative Commons Attribution 3.0 License. Website by Pattrn.